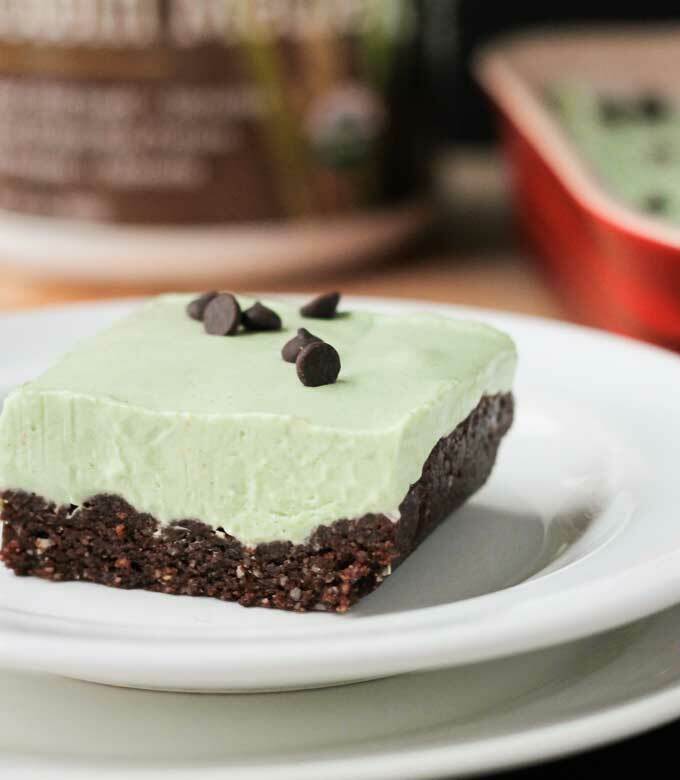 Mint Cream Icebox Dessert w/ Raw Brownie Crust – this incredibly easy no bake dessert is packed with superfoods, bringing you loads of nutrition in this indulgent treat! Just want to let you know that this post is sponsored by my friends at Oriya Organics. I only recommend products that I use myself. All opinions are my own. This time of year I’m usually hoarding boxes of thin mint cookies in my freezer, pulling them out a sleeve at a time, and eating (inhaling might be a better word) the entire sleeve. Not exactly the healthiest thing a girl can do, right? Unfortunately (or, as luck would have it), the girls I usually buy from are no longer in girl scouts. So, what’s a frozen thin mint lover to do? Create their own frozen chocolate minty deliciousness! And, even better, make it healthy!! 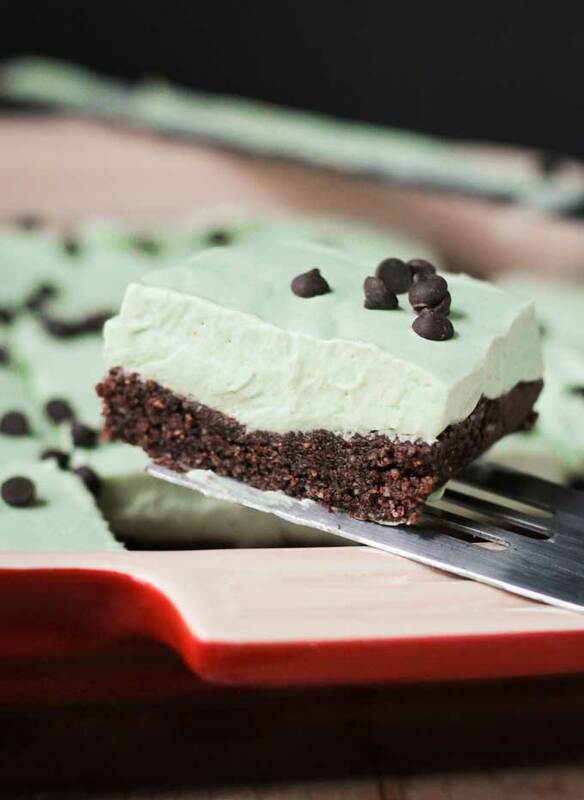 This Mint Cream Icebox Dessert w/ Raw Brownie Crust will have you forgetting all about those little cookies. It’s super easy to make and boasts a fudgy crust with a light-as-air minty cream filling. The mint cream filling is fluffy and light with a super fresh minty taste that’s not overwhelming. Truth be told, I’m not a huge mint fan, but I do like it paired with chocolate when it has a subtle flavor – like in those addictive cookies. 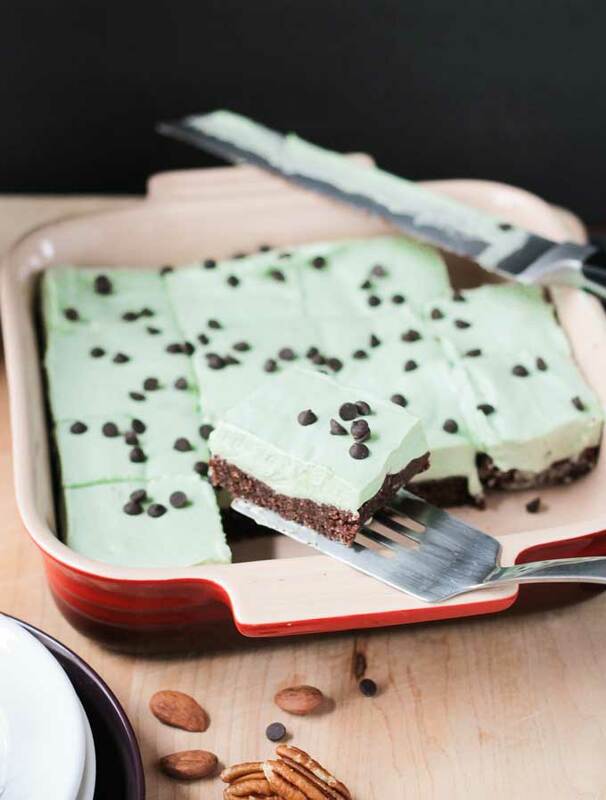 The amount of mint I used in this icebox dessert is the perfect amount to bring out the minty freshness without overwhelming. And that gorgeous pastel green color – that’s not food coloring! That is Oriya Organics Superfood Protein Medley! Keep reading to find out how you can win a bundle from Oriya Organics to try for yourself! This protein powder is organic, non-gmo, vegan, gluten free and raw. All of Oriya Organics’ products are free from sweeteners (most plant based protein powders contain stevia, which has a very strong taste), fillers (xantham gum, soy lecithin, maltodextrin, etc.) and “natural” flavors, like chocolate or vanilla (which sometimes aren’t very natural at all). You’ll only find real, whole food, nutrient rich ingredients in these products. The Superfood Protein Medley also contains all the essential amino acids, making it a complete protein. 18 grams of complete protein in every serving to be exact! Not to mention all the fiber, vitamins, minerals, omega-3 fatty acids and antioxidants each serving contains. 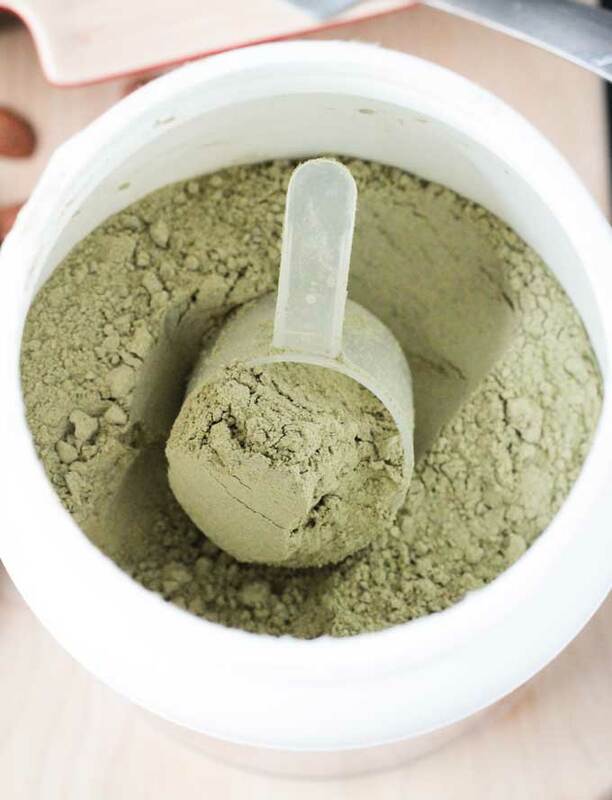 The texture of this Superfood Protein Powder is super fine. It blends beautifully with no chalky or gritty residue. I didn’t even put the filling for this Mint Cream Icebox Dessert in the blender….just whisked it all up by hand. And the flavor is neutral, so you won’t taste it either. Trust me, you would never know this tasty treat contains protein powder! Don’t be afraid to take a few spoonfuls of the Mint Cream straight to your mouth before you even get around to pouring it on the crust. I was practically drinking the stuff! Which reminds me, this protein powder is excellent in smoothies too! I think I’m going to have to make a mint cream smoothie next! And the raw brownie crust is perfect all on it’s own as well. But, together, they are a match made in heaven. Fudgy crust, creamy filling, chocolate and mint – are you drooling yet? My kids have claimed this to be their new favorite dessert and I certainly don’t disagree. And considering how easy it is to make, this might just be taking up space in our freezer every week. Alright, you guys MUST make this! It would be perfect for all of your spring entertaining or just a delicious family treat after dinner. Please come back and let me know how many pieces you ate in one sitting because you loved it so much! Leave me a comment below with your feedback and star rating. This incredibly easy no bake dessert is packed with superfoods, bringing you loads of nutrition in this indulgent treat! All the flavors of your favorite minty girl scout cookie in an icebox dessert. The gorgeous pastel green color makes it the perfect treat for springtime. Line an 8x8 baking pan with parchment paper so the ends hang over the sides (I like to spray the bottom of the pan before I place the parchment paper so it sticks to the bottoms and doesn't move around while you spread the dough) and set aside. Place almonds and pecans in a food processor and pulse until a flour-like consistency. Add the cacao powder and flaxmeal and pulse a few times to combine. Add the dates and process until the mixture comes together into a sticky ball. Add 1-2 tbsp water if needed, to reach this consistency. Press the dough evenly into the pan and place in the freezer while you make the mint cream. Place the coconut cream, brown rice syrup, vanilla and mint extracts and the Oriya Organics Superfood Protein Medley in a medium mixing bowl and whisk until smooth. Add 1-2 tbsp of organic powdered sugar if you want it a bit sweeter. 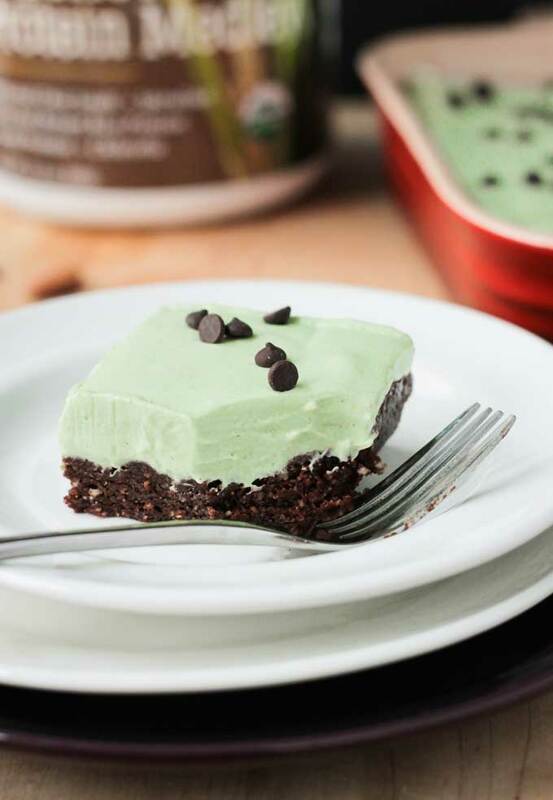 Pour the Mint Cream over the Raw Brownie Crust and place in the freezer to set. It should be firm enough in a couple of hours. Pull the whole 8x8 square out by the parchment paper "handles". Cut into squares and enjoy! You can purchase this protein powder straight from Oriya Organics or you can enter to win below. 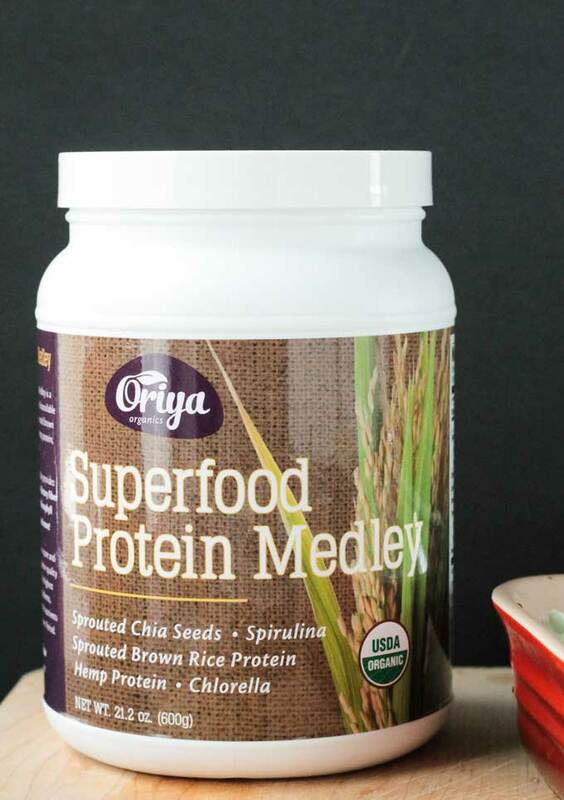 The good folks at Oriya Organics are generously providing a container of Superfood Protein Medley, a container of SuperGreen Medley and a shaker cup to one lucky winner. What creations will you come up with? Good luck! This was fabulous! Tastes just like real brownie batter but soooo much healthier. Definitely keeping this recipe around. I’m so happy you love it, Katie! Thank you! Would it still taste as good if I left out the protein powder? Yes, definitely! The protein powder is for the added nutrients and the beautiful color, but it doesn’t lend any flavor at all! Let me know if you try it! 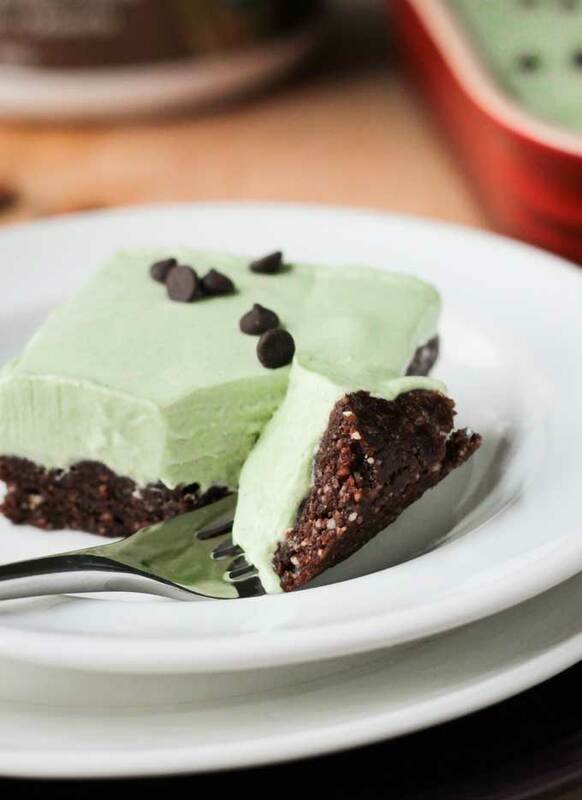 I love chocolate mint desserts and this one seems so easy to make. It’s on my list to make this week! Yep, so easy! The hard part is just waiting for it to set up…luckily that doesn’t take too long either. I can’t wait to hear what you think, Kathy!! Thank you, Sina! It’s such a good combo, right?! You did it again Jenn. I seriously want to eat everything you make! These look like mint chocolate heaven! Thank you so much, Gin! You are so sweet! This recipe is over the top Jenn – I can’t believe how amazing it looks and how seamlessly you used protein powder. That’s always a challenge for me. Thank you, Alisa!! This protein powder blended so perfectly! No aftertaste and no grittiness at all. That’s so good to know – I haven’t tried that brand. Love mint and chocolate! Looks delicious and so pretty! Love that light green color. This is my favorite flavor combination. That is the most light and airy dessert, I can only imagine how creamy it tastes. I love that you put the green powder in it. Just perfect! i love how creamy the icecream looks….and the raw brownie crust, i want a whole pan to myself. I won’t judge if you eat the whole pan, Dixya!! 🙂 Thank you!! Looks so pretty! I love thin mints in the freezer, I created a Thin Mint Freezer fudge last year for that same reason. Eating those yummy cookies straight from the freezer growing up, oh man, nothing better! This ice box dessert looks so creamy and rich! I love using coconut cream to make frozen desserts! I love mint with chocolate, one of the best combos ever, but you have to be careful of too much mint, or it tastes like toothpaste, LOL! And I’m so glad you got to work with Oriya, they are great! Oooh, I don’t think I’ve seen your fudge. Will have to check that out! I’ve got a springtime fudge in my mind as well..just got to get around to whipping it up. 🙂 And, yeah, too much mint is not a good thing. Like I said, I don’t even really like mint…except in very specific situations. Like THIS one. 🙂 I was super impressed with Oriya’s products. Extremely clean and healthy! Thanks! Thank you, Aimee! No one would ever know they are super healthy…well, now everyone knows because I told them. LOL. But you could surely fool your guests! I wish I could send you one virtually!! Thank you so much, Hedi! With all the superfoods in there, they would be perfect for an afternoon slump! I’ve never heard of Campfire and I can’t believe you’ve never had a Girl Scout cookie! No need to start now though, just make yourself some of this yumminess instead! 🙂 Thanks, Cadry! This dessert looks awesome! Thanks for the giveaway; I’ve entered and hope to win! I also pinned this to make it later. Thanks! Thank you so much, Debi! Thanks for the PIN and Good Luck! This looks amazing! Thin mints in the freezer? Never tried it. Sounds wonderful! I’ve been craving frozen desserts like crazy lately, so this is going on my soon-to-make list ASAP! Thanks, Taylor! I hope you do make it. Please come back and let me know how it turns out! Enjoy! I’m not super into desserts, but this looks too good not to try! Wonderful job! Hubs would love this! He is a nut for those thin mint cookies! Beautiful photos! Mine too! He’s a mint fanatic and he approved this recipe! 🙂 Thanks, Kathi! I love desserts with no food coloring!! awesome! Yes, I don’t like having to resort to chemicals! Not only does this contain no chemical food coloring, but it’s all healthy really superfoods! Thanks, Kristen! Frozen thin mints! Why did you even plant that thought in my head, I had almost forgotten about them. No it’s okay, since you provided me with a healthy alternative to satisfy the craving. Actually this looks a million times better than thin mints. Not as instantaneous, but much much better! That whipped top layer, girl scouts got nothing on that <3 The color is perfect, the texture looks perfect, and I love how you snuck the protein powder in too! I don’t really like mint either, Uma. This was a really mild flavor…and I do add vanilla as well to help mellow it out. But, yes, you can just add ore vanilla instead! Thank you so much, Rebecca!! They turned out even better than I had hoped! I hope you love them!